Accessories for cars and motorcycles, flags accessories catalogue. In this section you can find all the supports to expose the flags outside your car. 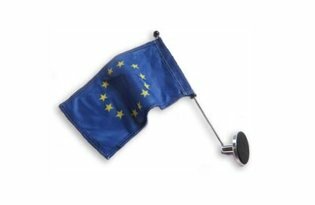 From kits consisting of 2 flexible flag pole for diplomatic cars, up to single support to display your flag on your car. We also have other types of supports to expose your flag from your car. We have economic solutions but also professional solutions that involve cutting the bodywork or the puncture of the car's hood to expose the pole to which you will fix your flags. Flagsonline offers kits that consists on two stands, equipped with a magnet and its poles, tilted into different positions. In this way you can assemble and disassemble the diplomatics stands from the car very quickly. The stands are tested for a cruising speed of 80 km / h.
For embassies and consulates there are countless solutions to be applied to diplomatic cars. The magnetic supports, in fact, were not designed for high speeds, but for a moderate cruising speed around 80 km / hrs. Contact us and we will find the best solution to the type of use you need to do.